The classified listings make up only a portion of the information that can be found in the Northwest Side Press and Reporter / Journal. 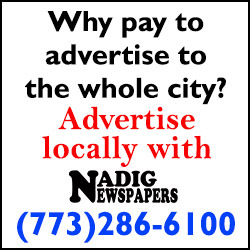 To take advantage of everything our newspaper has to offer including local news stories, help wanted ads, business listings and much much more click here to find a store near you that sells our newspaper. We also offer door to door delivery in select areas as well as internet subscriptions. Contact the office to find out more. We currently have a limited time offer for placing Garage Sale ads. Please visit the Classified section of our website or pick up a current edition of the Northwest Side Press or Reporter / Journal to find out more. Interested in placing a Classified Ad? Classified Ads are published in both puplications, the Northwest Side Press and the Reporter, as well as posted on our website. Reach 20,000+ with Nadig Classifieds.